Biogear Oils are vegetable based formulations recommended for lubricating spur, helical, bevel, and worm gear configurations. 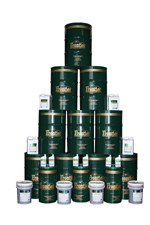 Biogear Oils are bio based lubricants intended for heavy-duty applications subject to heavy loading or shock loading. Classified as ultimately biodegradable (Pw1) and non-toxic, Biogear Oils are ideal for equipment operating in environmentally sensitive areas.